Seems odd we just saw Tim Burton’s “Alice in Wonderland” a few days before this. So…out to the Old Vic all last week…seems I had a bunch of time to take off from work (mandatory) before the end of March or I would lose it. Sad, methinks…that they have managed to complicate what hours are what so much so that I’ve no idea what time is what anymore. Sad thing is neither does the department that is supposed to track all this fiasco…but that’s all another story. Time off I had…and it’s a real relief to get away…so off to work I went. I had help…the wife was there of course…and my friend Mike came up for a few days…and we accomplished a LOT (as the aches, bruises, and stiffness will attest). But more about that later…this tale is about a tail…a white rabbit’s tail in fact. Fat, and tame enough to allow approach (but not quite allow picking up) he was obviously an escaped pet. He wasn’t wearing a topcoat or carrying a watch, but I said, “Good morning.” just in case. 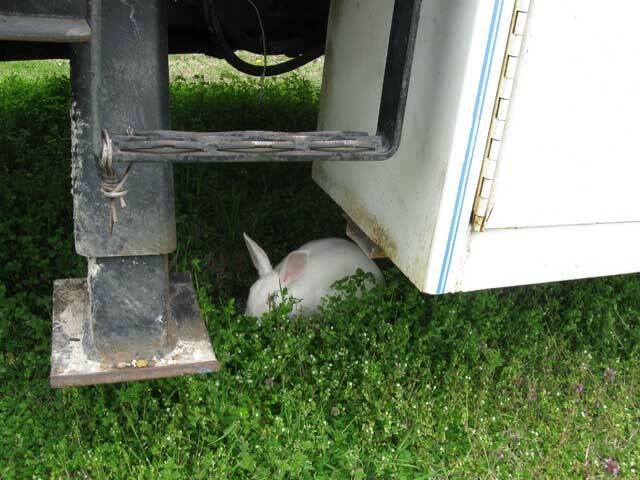 He didn’t reply to that…or to my query to see if I was late…indeed, he seemed quite content to hang out under the truck and eat clover. Ur…which reminds me…despite the 7 inches of snow we got today it is once again time to start mowing the lawn…pardon me whilst I scream a bit….BAGGGHHHHHHHHHH! 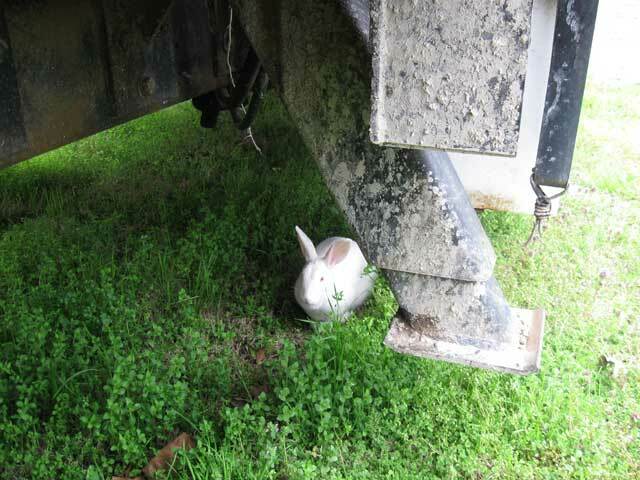 None of the neighbors seemed to be missing a white rabbit, and the thought of allowing one to have unfettered access to a bucket truck is just too scary to entertain…so I mentioned it to the animal control officer at lunch…he hadn’t heard of any missing ones, but said he’d come by and get it later that day. Keep in mind he escaped from an armed officer that is used to dealing with pretty much anything from cows and horses to pitt bulls. And the rabbit got away. Oh…and if I had to guess…no Easter eggs for me. One Response to The tail/tale of the White Rabbit.